Vampires, passion, sparkles, and love. There’s only one series that has it all: the Twilight Saga. The Twilight Saga: Breaking Dawn Part 2 hit theaters with high expectations from its “Twi-hard” fans. I have to admit, after failing to finish Breaking Dawn Part 1 purely because I fell asleep half-way through from immense boredom, I was not all that excited to see the finale. But after seeing the burst of positive feedback online, I decided it would be worth the watch. The movie starts out with Bella Cullen opening her newly blood red-colored eyes, coming to realize that she is now a newborn vampire. She begins testing out her abilities on a hunt with her husband, Edward Cullen, where she quickly learns how to control her senses and abilities. She then meets her daughter, Renesmee, who shows her a memory of the first time they really met when she was a newborn. To add to the shock, it is revealed that Jacob imprinted on her daughter, meaning that Jacob is in love with Renesmee. Later on, while in the woods, Bella’s daughter was spotted and mistaken for an “immortal” child, and the Volturi was notified. Immortal children were known to destroy entire villages in the past, so they were a threat since they could expose vampires to the outside world. After Alice sees a vision of the Volturi coming to get them, the Cullens began scouting out fellow vampires to help prevent the Volturi from believing that Renesmee is an immortal child. Days of intense training go by so that they are all prepared in case there is a war, and the day finally comes. The movie ends with the fight scene between the two clans, and a mind-blowing plot twist sums it all up. The ending shows all the characters that have ever been in the Saga, bringing tears to all the fans as it becomes clear that another powerful and memorable journey has come to an end. Overall, I thought the movie was very touching, and the fight scene was extremely exciting to watch, as it kept me on the edge of my seat, wondering what was going to happen next. I thought they portrayed Bella’s character really well by focusing on her features as a newborn. I really enjoyed the fact that the movie followed the book really closely, with only a few changes that added to its success. 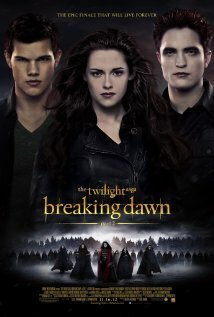 I think many agree that Breaking Dawn Part 2 was a great movie that ended the series very nicely.